The entire world has been eyeing on North Korea as it was trying to develop an ICBM on the pretext of its space programme which is reported to have failed. America and other civilised countries had criticized this attempt of North Korea. The list of nations that have criticized this step also contains the name of world’s largest democracy –India. Is there any other aspect that India aspires to achieve than becoming economic superpower? To go bit deeper within this question we need to first pose another question to ourselves that is it possible to become a global power without strengthening its weaponry? To be more specific lets replace the word weaponry with nuclear arsenals and delivery mechanisms. To explore deeper into this problem we need to dig into India’s geopolitical surroundings. It turns out that India is situated in the most barbaric and communist neighborhood. On the western front India confronts the most radical Islamic extremist dictatorship and military regime which openly supports terror groups such as Al-Quida/Jaish e mohommad/Lashkar e toiba etc. and on the eastern front is Evil communist China that doesn’t think twice before engulfing and capturing an entire huge country like Tibet and killing at least 500,000 saints. Having forced to fight over 5 wars within a short period of time and uncountable skirmishes, India is exposed to most rough surrounding; any country in the world (including Israel) has ever been exposed to. Against the barbaric nature of Pakistani regime Hitler seems to be a dwarf. This is the justification Indian authorities may give for developing ICBM ,Agni 5 ,with an alarming maximum range of 8000kms with low payload and 5000kms with full payload capacity and having a capability of MIRV (multiple independent re-entry vehicles). 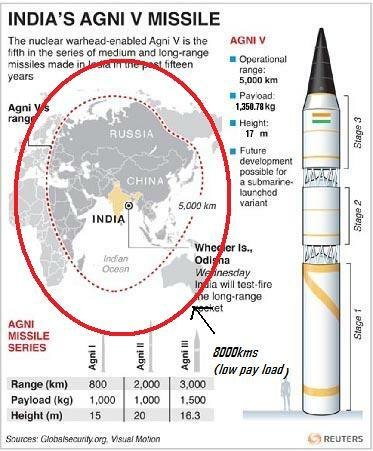 Having been exposed to threats that are anti-democratic and terrorism supportive in nature the Indian authorities have justified the development of agni 5 (even though agni 4 was MIRV and capable of hitting on any part of China or Pakistan) by saying that they want the capability to hit any part of China from any part of India. India wants to keep power with itself although never want to use it. Track record suggests that India has never started any war against any nation till date thus it’s claims may hold credibility. This capability is an addition to pre-existing capability that India has of nuclear powered submarine launcher as a launching base for ballistic missile (Only veto countries have this capability besides India. Picture of arihant being posted below). Since 1992 India is also suspected to have deployed ICBM surya in mainland as well as forward base in Kazakhstan to deter all possible threat to its sovereignty. 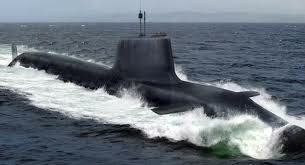 It is said to be capable of hitting any point on earth with nuclear arsenal. This occasion, as the author of this post, I would like to take for lobbying in favor of India for having such a transparent missile programme besides being in a neighborhood of countries like North Korea, China, Iran and Pakistan which have not followed a single protocol and have demolished all laws and rules to dust! The history has it that after the Second World War, China got the nuclear technology by reverse engineering Russian technology. Pakistan stole the uranium enrichment process (vital for nuclear explosion by initiating a chain reaction) by bribing western scientists and money was arranged from Saudi Arabia and Iran in the name of Allah, Islam and Jihad. This was done by a Pakistani state sponsored terrorist called Abdul Quadir Khan. To honor and glorify this terrorist Pakistanis set up a lab called AQ khan lab with the money that was donated by World Bank to Pakistan for fighting poverty. This laboratory traded away technology required for enrichment to North Korea in exchange for rocket delivery mechanism. In this entire process China acted as a liaison to facilitate the exchange of technologies directed against democratic and civilized nations such as India, Israel, South Korea, America, etc. Browsing through the news a very interesting article could be found regarding Indian ICBM Agni 5 which it test fired on 18th April 2012. [the Hindu]. India is the only Asian country [and only non-veto country in the world] that has developed both the nuclear technology and missile delivery mechanisms on its own scientific strength and technological advancements without violating any international rules or treaties. The scientists in India give priority to pin point precision rather than range and reason for this is simple. Their aim is to hit target on bulls eye range and deter to only those threats which are potentially hostile towards the democratic republic of India. In no circumstances shall it pose a threat to any other entity directly or otherwise. It has excellent relations with western countries and it does not choose to go beyond 8000kms. “a lot of scope in improvement of range of agni 5 is there” quotes a DRDO official. India spends less than 1.6% of its GDP on defense directly or indirectly. The money that India spends on weapons technology is circulated within Indian territory only and hence it is used in employment of Indian people only. Products developed in India be it medicines or cars are of highest quality standards and have potential for international purchases as compared to low quality Chinese products. This way a lot of royalty can be brought to Indian organizations. Security and economy has to go hand in hand. There would not be any India and it would be invaded like Tibet if India ignores our security. Posted on April 19, 2012, in missile tech and tagged 1962, 1971, Agni, Agni-V, China, DRDO, India, Intercontinental ballistic missile, Kargil, Kashmir, Multiple independently targetable reentry vehicle, North Korea, Pakistan, POK, World Bank. Bookmark the permalink. 5 Comments. I have to say, i’m impressed with the comprehensive data you have collected to write this post. Surely Agni project would help India become a superpower, and India’s proven to be non-aggressive, so the weapon proliferation is under the right eyes. keep writing and let people know about the world they live in (having proven that most Indian don’t know what PoK is!). Thank you for appreciating my effort.People like you are my inspiration.Stay tuned for next article on world’s biggest stealth fighter plane program(F-35). Nice to see you again. I like the warrior avatar. Actually its David From David and Goliath. The story is perfect example of how a good weapon selection can really come in handy. i can assume you’re an expert on this subject. Well with your permission allow me to grab your feed to keep updated with forthcoming post. Thanks a million and please continue the enjoyable work.